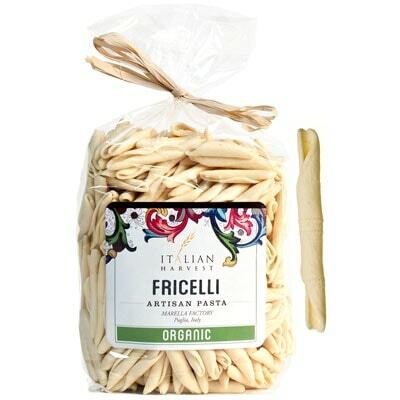 Fricelli is another scrumptious pasta from the amazing artisan pasta makers Marella. A type of pasta typical of the Puglia region, Marella pasta makers make these by hand. In addition to that, when you cook it, it has the consistency and flavor of fresh pasta. Simply amazing, don’t you think? This pasta can be great with all kinds of pasta sauces. You may use any cream, tomato, and meat sauces. However, it is best with fresh tomatoes and scrumptious fried eggplants. Excited to try out these uniquely scrumptious pasta? Then go and grab a bag now!